Plan des Cotes de Terre Neuve IIIe. Feuille Contenant la Partie Meridionale depuis les Iles de Bergeo jusqu au Cap de Raye, avec l'Entrée du Golfe de St. Laurent comprise entre ce Cap et le Cap de Nord de l'Ile Royale. 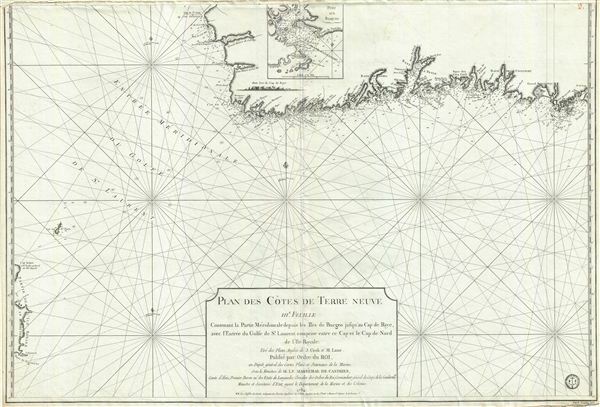 A scarce 1794 map of the southwest coast of Newfoundland, Canada, issued by the Depot de la Marine and surveyed by Captain Cook. This map, the third in this series, covers from Cape Anguille on the Gulf of St. Lawrence, southwards to Channel-Port aux Basques, then east past La Poile Bay, as far as Burego. To the south, just appearing at the bottom left corner of the map, is the nearby northeast coast of Cape Breton. The coast is dotted with soundings and the seas full of rhumb lines. This map was surveyed by Captain Cook and it is in these surveys that he mastered the nautical surveying skills that would prove so effective on his subsequent three great voyages of discovery. It was published by the French Depot General da la Marine. Captain James Cook (7 November 1728 - 14 February 1779) is a seminal figure in the history of cartography for which we can offer only a cursory treatment here. Cook began sailing as a teenager in the British Merchant Navy before joining the Royal Navy in 1755. He was posted in America for a time where he worked Samuel Holland, William Bligh, and others in the mapping of the St. Lawrence River and Newfoundland. In 1766 Cook was commissioned to explore the Pacific and given a Captaincy with command of the Endeavour. What followed were three historic voyages of discovery, the highlights of which include the first European contact with eastern Australia, the discovery of the Hawaiian Islands (among many other Polynesian groups), the first circumnavigation of New Zealand, some of the first sightings of Antarctica, the first accurate mapping of the Pacific Northwest, and ultimately his own untimely death at the hands of angry Hawaiians in 1779. The influence of Cook work on the mapping and exploration of the Pacific cannot be understated. Very good. Minor wear along original centerfold. Unusual older fill repair at two places on verso.